Psst! Saint Valentine’s Day is next week. It’s the most romantic day of the year, so you better not mess it up. Cards, chocolates, and flowers are expected. A fancy dinner is, too. But all you really care about is the wine. This is the time to pull out your nice glasses that rarely get used and pop open a bottle that you’ve been saving for a special occasion. That wine might be the biggest surprise of an otherwise cookie-cutter holiday. This year’s selected bottle doesn’t come from Burgundy or Rioja or Tuscany. It isn’t from Napa or Sonoma either. But it is from the United States. New Mexico has a surprisingly long history of producing wine. Franciscan monks first planted vines here in the 17th century. They flourished for two centuries, until a combination of the mighty Rio Grande flooding and Prohibition forced most of the wineries in the Southwest to close. The industry was reborn in the 1970s, when small wineries began planting more vines. The Gruet family, who already owned a winery in the Champagne region, started looking to expand their business outside of France around this time. They found hot days, cold nights, and arid air—which helps ward off root rot—in Southern New Mexico. So they planted Chardonnay and Pinot Noir grapes to begin making Méthode Champenoise sparkling wines. The award-winning Gruet Winery is now the second-largest winery in the state. Gruet Winery’s production and tasting room is in Albuquerque. New Mexico’s largest city sits along the edge of the Sandia Mountains and straddles the Rio Grande. It’s famous for its historic Old Town, hot-air balloon festivals, brilliant sunsets, and green chiles. The peppers, which have a back-end spiciness, pair perfectly with sparkling wine. 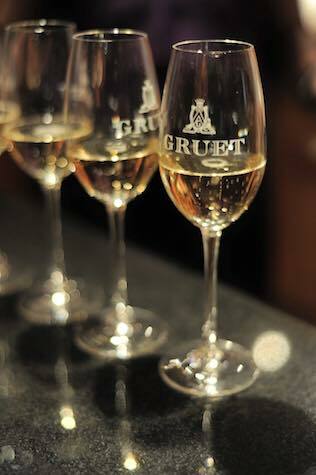 At the winery, you discover that Gruet now produces both sparkling and still wines. There’s a Cabernet Sauvignon, a Chardonnay, a Pinot Noir, and a Red Blend on the still wine list. But, since they’re known for their bubbles, you opt for a sparkling wine tasting. The Blanc de Blanc is crisp and a little citrusy. The Blanc de Noir is creamy and complex. While the Brut Rosé is rich, fruity, and makes your mouth water for peppers. It’s the perfect Valentine’s Day wine. Now you just need to rethink your meal around it.